One hundred and ninety years ago Upper Canada (Ontario) was just being colonized, Beethoven, with less than a year to live, premiered his Quartet #13 in B flat major (Opus 130), the friction match was invented and John Quincy Adams served as sixth President of the United States of America. 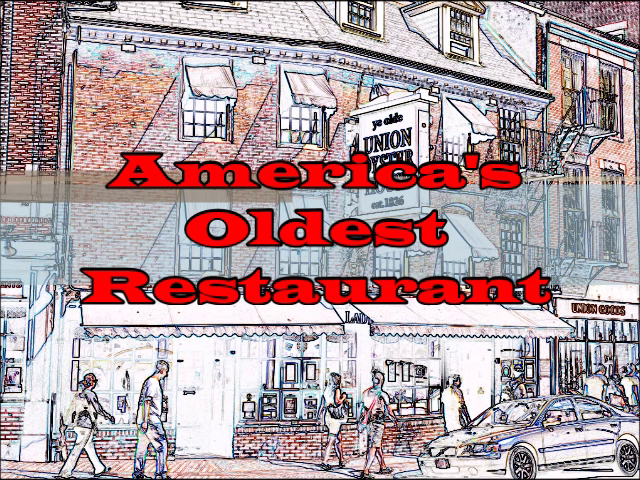 At the same time, the year 1826, Ye Olde Union Oyster House opened in Boston, Massachusetts. 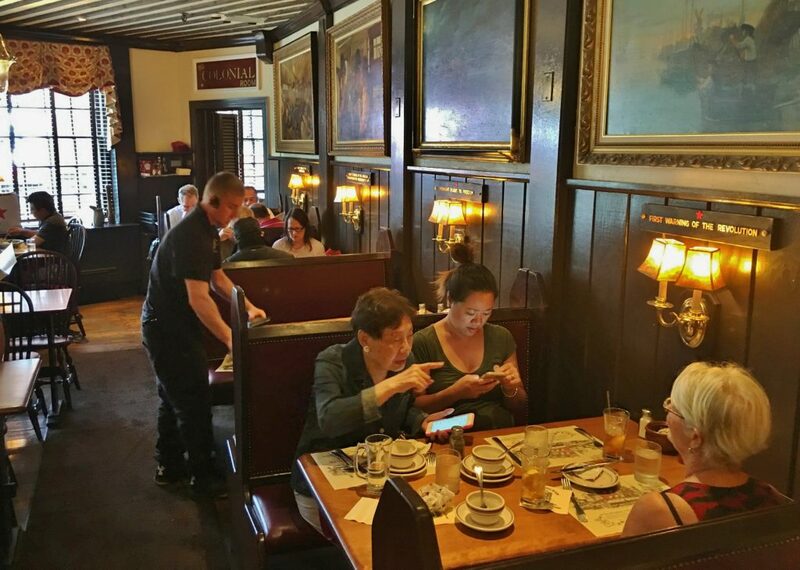 It has been serving food and drink ever since, making it the oldest operating restaurant in the United States. I was in Boston last month to soak up some of the city’s history and fulfill a longtime wish to tour the John F. Kennedy Presidential Library and Museum. Given its historical significance, I couldn’t resist visiting Union Oyster House. 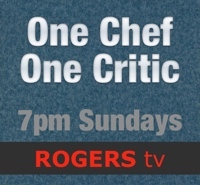 How often does one get to combine a love of history, restaurants and food? Union Oyster, by the way, also has a strong connection with the late President Kennedy, and with the great Massachusetts senator, statesman and orator, Daniel Webster, about whom Kennedy wrote in his Pulitzer Prize winning “Profiles in Courage”. Everywhere you go in Boston there’s history, and people who trade in tourism make the most of it. Apart from a few ugly sightseeing trolleys, one or two crude souvenir shops and the awkward Boston Tea Party tourist trap at the harbor, everything appears to be tastefully preserved and presented. 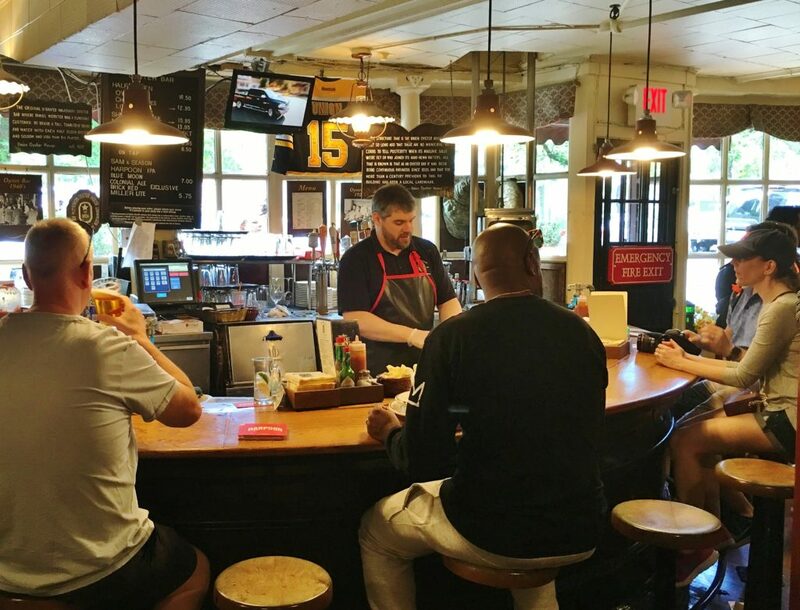 Union Oyster, a busy, efficiently run eatery, has evolved since 1826 but still very much maintains the look and atmosphere of a well-preserved if aged institution. Just inside the main entrance is the oyster bar itself. It’s u-shaped and made of mahogany. A sign above the oyster shucker (busily shucking bivalves for hungry guests seated on stools around the bar) tells the story of Daniel Webster’s association with the restaurant. Apparently the venerable senator visited often and would take a seat at the bar where, quote, “He drank a tall tumbler of brandy and water with each half dozen oysters, and seldom had less than six plates.” It was easy to picture old Daniel there washing down his 36, 42 or maybe even 48 oysters with slightly diluted brandy. Gurgling nearby there’s a large lobster tank filled with the crustacean for which Boston is famous. It seems every kind of Boston food vendor and restaurant serves lobster-this or lobster-that. I was told there’s still a law on the books that says prisoners are not to be fed lobster daily as the practice had been deemed cruel. Behind the lobster tank, dark, polished wooden booths were grouped near a drinks bar. 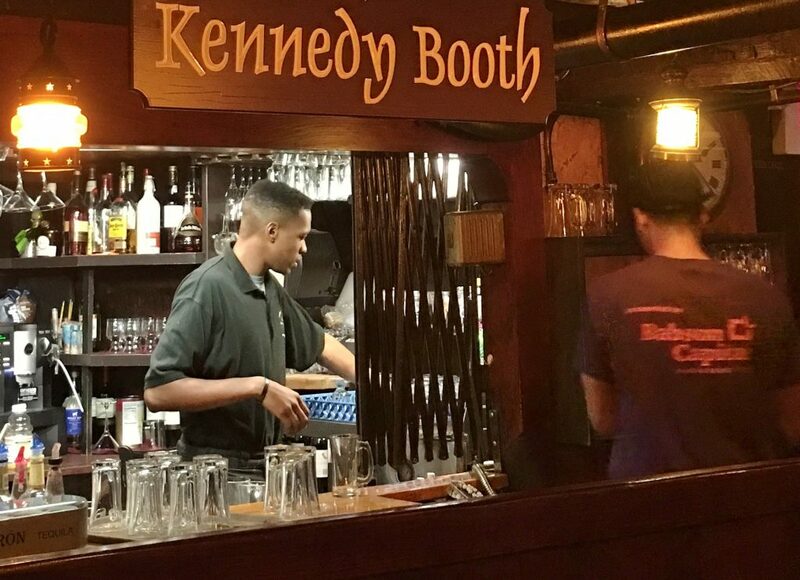 My view of the bar’s liquor bottles was partially obscured by a large sign, hung from the ceiling, which read, “The Kennedy Booth”. 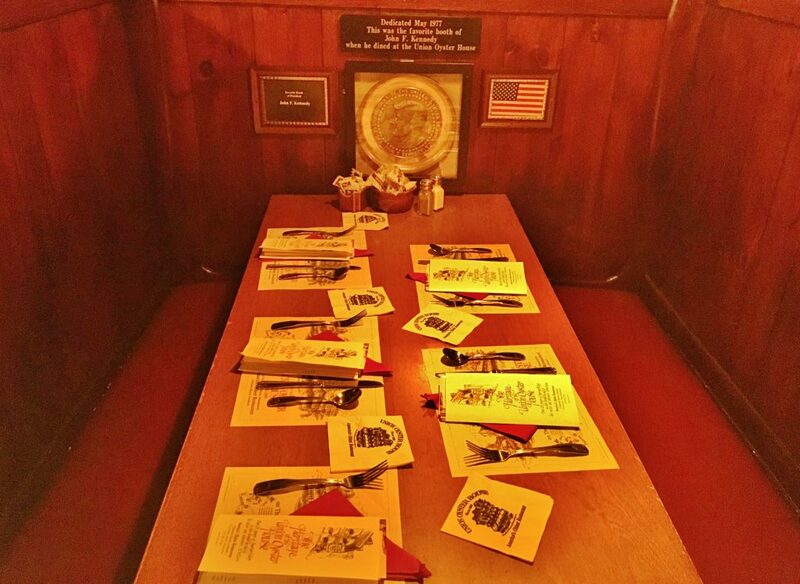 Booth 18 was where President John F. Kennedy dined on a regular basis, at least before he became the President. 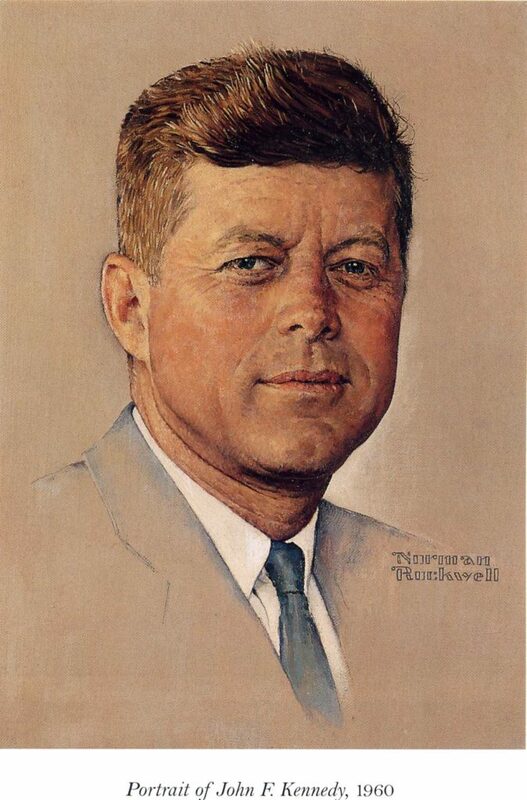 It was his favourite and JFK’s favourite Union Oyster dish was the lobster chowder. You can still book his spacious booth. It seats six. In case there’s any doubt about which booth it is (apart from the conspicuous overhead sign) the space contains a framed plate bearing JFK’s likeness and a plaque which reads, “Dedicated May 1977. This was the favorite booth of John F. Kennedy when he dined at the Union Oyster House.” Plaque and plate were fine but I did think hanging the sign was a bit crass. Upstairs is mostly dining tables and booths in a similar environment, i.e. registering of history with colonial furnishings, dark woods, paintings and traditional fixtures. Numerous varnished oil paintings of historical events seemed at home in the room. Each had a title as in: “Midnight Flight to Freedom” and “First Warning of the Revolution”. One featured Daniel Webster sitting at the oyster bar with his brandy and oysters. 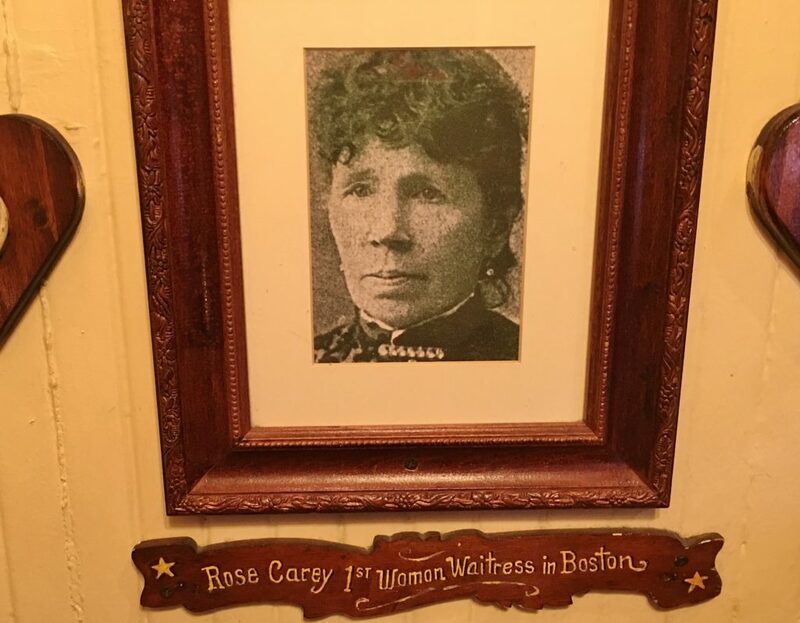 On the way upstairs I saw a photo of Rose Carey. She worked at Union Oyster House beginning around 1920 and was the first woman waitress in Boston. One of the most remarkable bits of Boston and Massachusetts history is that Louis Philippe, Duke (duc) d’Orléans, the last King of France, lived on the second floor of the Union Oyster House building before it became a restaurant. It was a brief stay (made known on Oct. 21st, 1797 by Boston’s Columbian Centinel newspaper) during his exile but long enough for him to teach French to many of the upper class women of Boston. 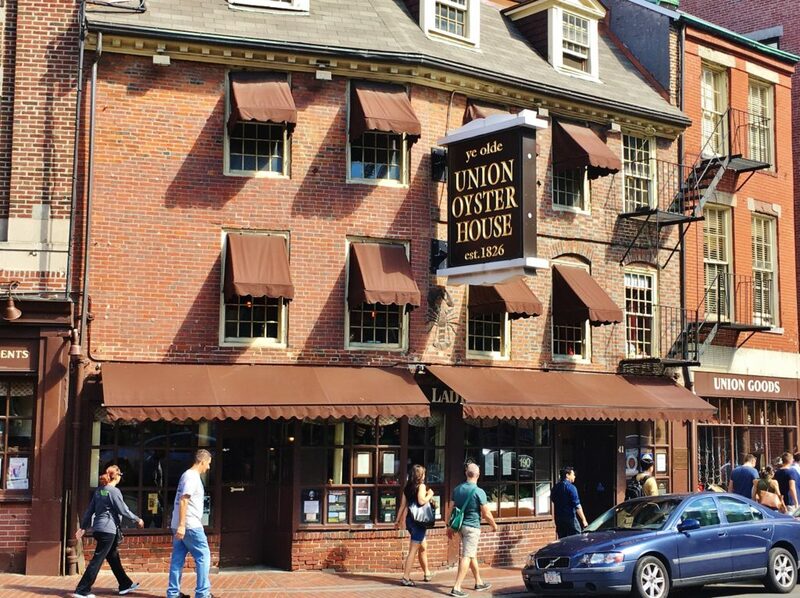 Union Oyster House offers traditional seafood restaurant plates: lots of broiled, grilled and pan seared scrod, haddock, swordfish, scallops and shrimp, as well as examples of Boston’s unique culinary heritage, as in Boston baked beans and Indian pudding. I’ll get to them but first I tried the oysters. Curious to see what they’d do with them I ordered the Union grilled oysters. Actually, it was the Parmesan and mozzarella cheese, with which they’d been smothered, that ended up being grilled or possibly baked. Essentially, the oyster meat under the cheesy lid had been par boiled in its own juices. 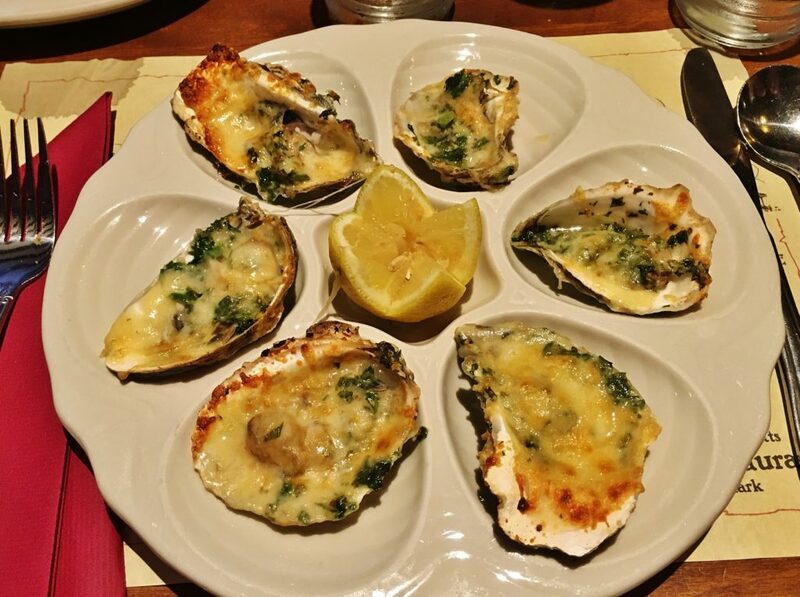 Classic Oysters Rockefeller is a much more interesting cooked dish but my favourite oyster is still raw with a squeeze of fresh lemon. 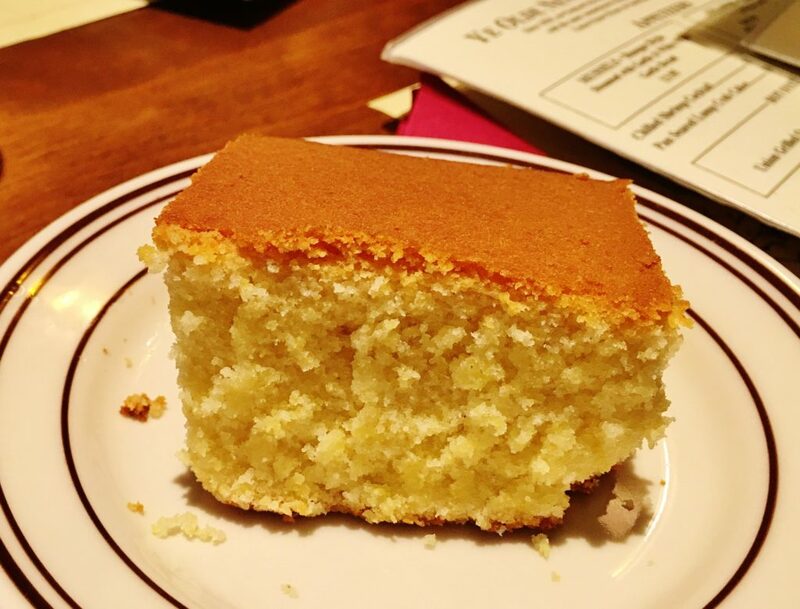 Boston Market style cornbread, cake-like and sweet, is what’s served at Union Oyster. It was a bit like eating dessert at the same time as your main. I suppose we could have saved it to have later with coffee but I had something different yet equally traditional in mind for dessert. 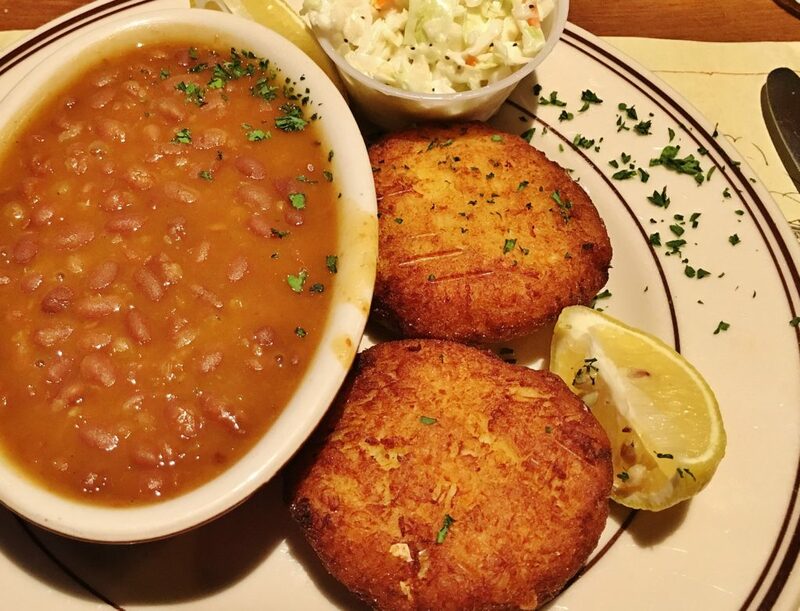 Fish cakes were served with Boston baked beans. The beans, tasting of the signature Boston ingredient, molasses, were a little soupy but good. Much better were the golden brown fish cakes featuring fresh fish held together with egg, potato and crumbs and seasoned with salt, pepper and parsley. 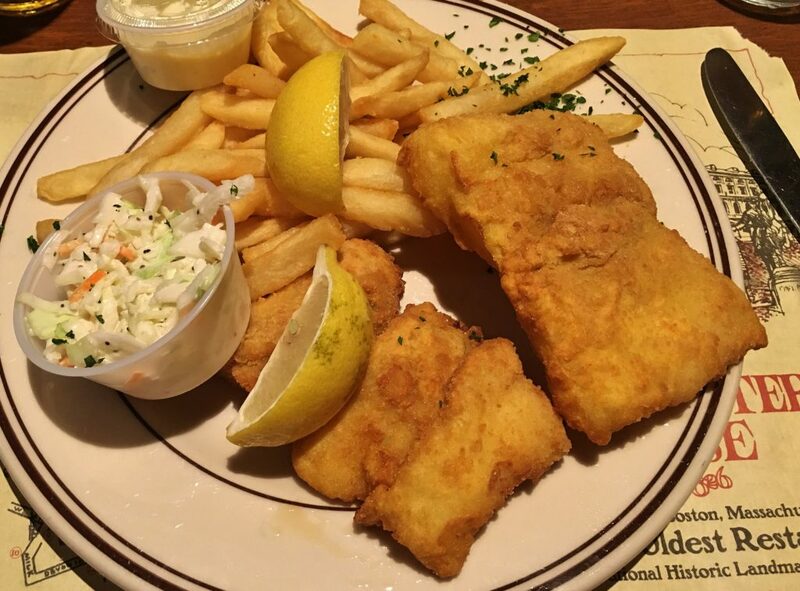 Being in New England I thought a seafood restaurant would do fish and chips similar to the way it’s made in England, as we do. But, that wasn’t the case at the Union Oyster House. Although succulent, the fish had been coated in cornmeal, which yielded a texture completely different from traditional battered cod. Chipped companions appeared to be mass produced but tasted fine. I think it’s likely that many of you have never heard of New England’s Indian Pudding. It’s an odd dessert and the Union Oyster House version was odder than I’d imagined. Longtime Massachusetts resident, Julia Child, first tasted it at an Amish restaurant in Lexington, Massachusetts. She introduced it to me through her original black and white PBS series. Indian pudding is made from (you guessed it) cornmeal, molasses and milk. This slow cooked pudding is supposed to be runny but Julia’s deep, dark pudding – with glossy, almost black skin – while appearing loose, still had shape when spooned onto a plate. She served it with the traditional scoop of vanilla ice cream. Union Oyster served mine with vanilla ice cream too. Otherwise it was very different from Julia’s and more like something Ebenezer Scrooge would’ve had before bedtime, very gruel-like, watery and brown, but (unlike Scrooge’s) with an overwhelming taste of molasses. 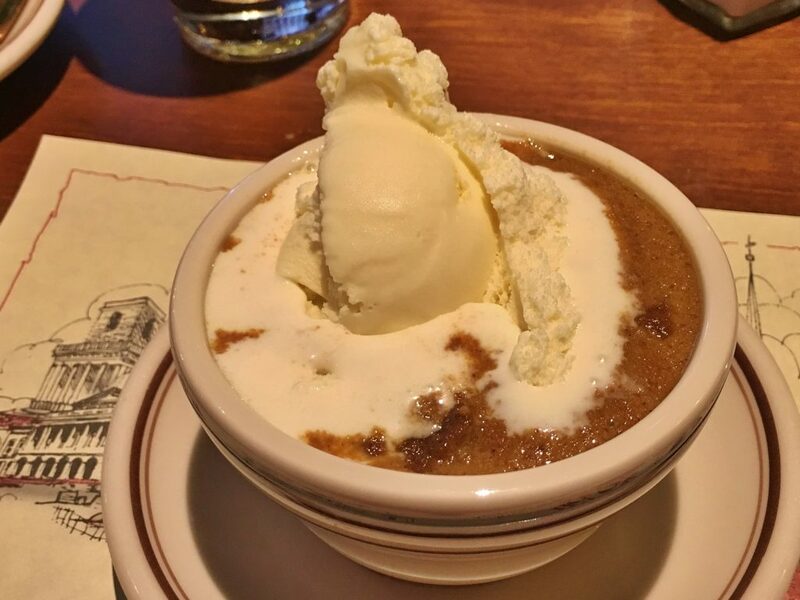 Indian pudding, Union Oyster style, is definitely an acquired taste. As an eatery I’d probably give Union Oyster House a miss, but as a place to experience some genuine Boston history, it’s well worth a visit.